The 2013 Rating Systems Challenge heads into the Final Four with only one top seed and two original picks remaining: 1 Louisville, which eighteen of twenty systems expected to make it this far, and 4 Michigan, which only the preseason polls expected to survive. Joining them are 4 Syracuse and, 2013's Cinderella school, 9 Wichita State. It should be pretty obvious by now which school the systems expect to win it all. The implications are now clear for the Rating Systems Challenge since the systems that picked Michigan to reach the Final Four do not expect the Wolverines to advance further, and since those are the systems that are currently winning. If the Cardinals fall short of winning the National Championship, the ESPN Preseason Poll will have been 2013's best prognosticator. If Louisville does win it all, that honor will fall to the FiveThirtyEight and the ESPN Computer systems. Last year's most successful system, Survival, picked 47/63. The median success rate was 41/63. 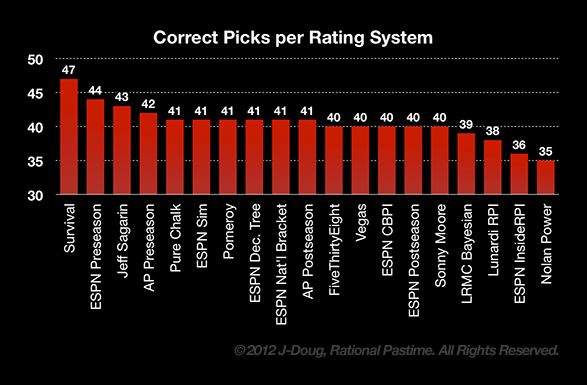 This year, the most correct picks any system will make is as many as last season's median performance: 41. The current leading system, ESPN Preseason, has correctly picked 40/60 thus far, and has only one possible correct pick remaining: Louisville in the semifinals. The systems that might surpass it in the ESPN scoring system made 38 correct picks so far. With only two games remaining they have no chance to catch up. If Wichita State upsets Louisville, no system will perform as well as last year's median system in terms of correct picks. The numbers look even worse using ESPN's weighted scoring system. This year, the best possible score is 1160 (the final score for ESPN Computer and FiveThirtyEight if Louisville wins it all). Such a score would have ranked 14th in last year's Rating Systems Challenge and beat only ~75% of brackets nationwide. However, with such a volatile tournament this season, it's possible that 1160 will be enough to finish among the upper echelon of ESPN entrants. Follow us on Facebook and Twitter—or tune in tomorrow—to follow each system's performance in the NCAA Tournament semifinals.